Tabula Prussiae: exima cura conscripta per Casparum Henneberch Erlichensem; et denuo edita per Nicolaum Johannidem Piscatorem. Visscher, Claes Jansz., 1586 or 1587-1652.,Jansson, Jan, 1588-1664. Atlantis Maioris Appendix, 1630.,Goos, Abraham, engraver.,Henneberger, Kaspar.,Vignaud, Henry, 1830-1922, former owner. Relief shown pictorially. 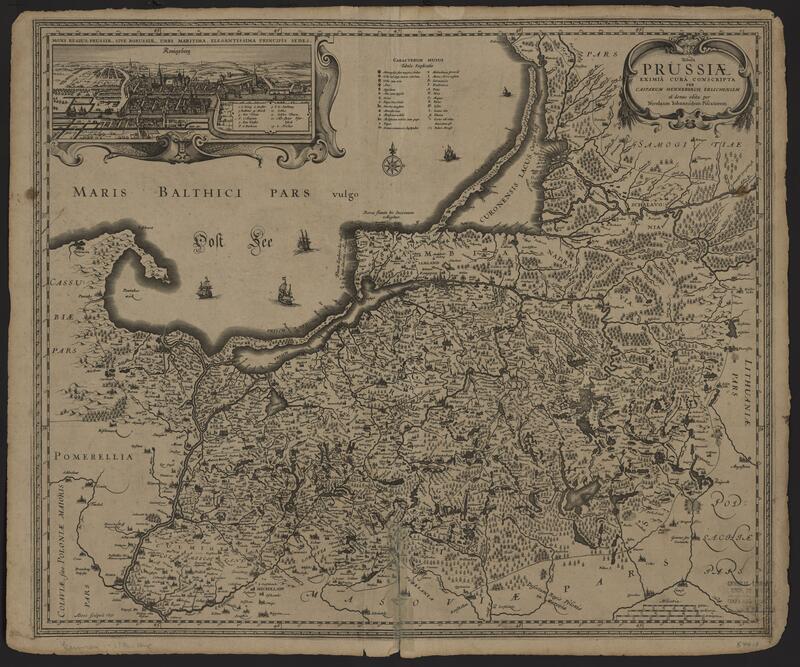 Includes inset view of Konigsberg. Includes illustrations of ships on the ocean and a face in the cartouche. Does not match any states listed in Van der Krogt. From "Atlantis maioris appendix", Johannes Janssonius, 1630. 1 map; 44 x 52 cm. This map is in the public domain. Please attribute access and use of this digitized map to the Stephen S. Clark Library, University of Michigan Library.